Training is essential for confined spaces and the hazards that may be encountered in them. This training should stress that death to the worker is the likely outcome if proper precautions are not taken before entry is made. 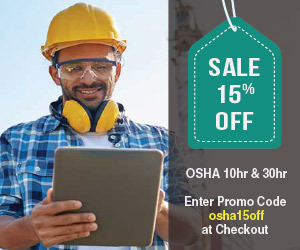 Course meets Federal and State training requirements and provides compliance with OSHA 1910.146 for general industry employees and OSHA 1926 Subpart AA for construction employees. 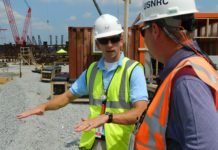 Newly Updated for new Subpart AA of 29 CFR 1926: The Confined Spaces Entry Training in Construction safety course is a detailed review of confined spaces for attendants, entrants, supervisors and managers where the student will learn about OSHA’s new Confined Spaces in Construction regulation (29 CFR 1926 Subpart AA) and its fundamental requirements. A confined space could be a utility tunnel, the inside of a boiler (only accessible when the boiler is off), the inside of a fluid storage tank, a septic tank that has contained sewage, and a small underground electrical vault are all examples of confined spaces. Ships and other vessels commonly have confined spaces due to the need for compartmentalized watertight construction. The exact definition of a confined space also varies depending on the type of industry. That is, confined spaces on a construction site are defined differently than confined spaces in a paper mill. Confined spaces that present special hazards to workers, including risks of toxic or asphyxiant gas accumulation, fires, falls, flooding, and entrapment may be classified as permit-required confined spaces depending on the nature and severity of the hazard. 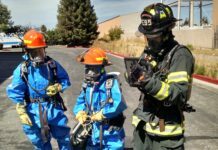 OSHA Fact Sheet – Is 911 your Confined Space Rescue Plan? 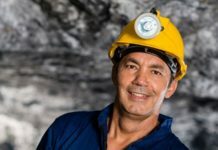 In the U.S., entry into permit-required confined spaces must comply with regulations promulgated by the Occupational Safety and Health Administration (OSHA). 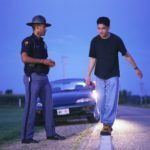 These regulations include developing a written program, issuing entry permits, assigning attendant(s), designating entrants, and ensuring a means of rescue. In addition to the hazards posed by the design of the space, work activities can also pose serious safety hazards (heat, noise, vapors, etc.) that must be taken into account when identifying safety measures that must be taken. Injuries and fatalities involving confined spaces are frequent and often involve successive fatalities when would-be rescuers succumb to the same problem as the initial victim. Approximately 60% of fatalities involve would-be rescuers and more than 30% of fatalities occur in a space that has been tested and found to be safe to enter. 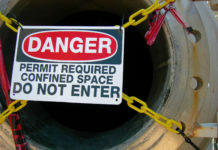 The causes of most confine space entry incidents are simple; employers and workers fail to recognize and control the hazards associated with confined spaces, and they conduct inadequate or incorrect emergency response, resulting in the death of the initial entrant, the would-be rescuer or both. Pre-planning for confined space entry should include all parties involved and should serve the purpose of reviewing entry procedures as well as covering specific hazards inherent to the spaces being entered. 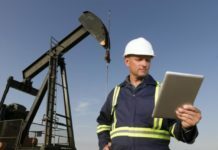 Confined spaces can be deadly because of the potential for engulfment, oxygen deficiency, oxygen enrichment, flammable gases or vapors, combustible dusts, toxic substances and other physical hazards. 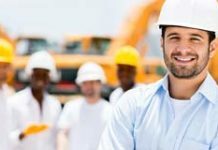 Other health hazards that could impact employee safety include electrical equipment, mechanical equipment, poor visibility, biohazards, claustrophobia, noise, radiation and temperature. The most common hazard seen in confined spaces is that of atmospheric hazards. These affect air quality and present immediate hazards to health or life. Acceptable atmospheric conditions must be verified before entry, and must be monitored continuously while the space is occupied. The oxygen concentration, the presence of toxic gases, and flammable material are the three conditions that must be monitored. Oxygen concentration is considered safe if it is between 19.5% and 23.5% of the total atmosphere. 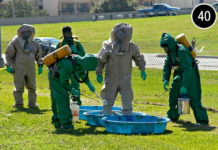 To protect against toxic gases, contaminants have permissible exposure limits (PELs), which are set by OSHA. Work also cannot continue if the concentration of a material reaches or exceeds 10% of its lower explosive limit. 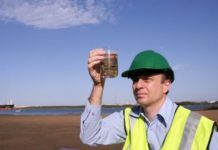 Even if a tank or similar vessel initially is tested and found to contain breathable air, a hazard can develop during operations inside the tank if residues inside the tank can release toxic gas or vapor when disturbed or if accidentally ignited. Steel water tanks may have dangerously low oxygen concentration when the interior rusts. Confined Spaces in Construction (PDF). Final Rule, (May 4, 2015).